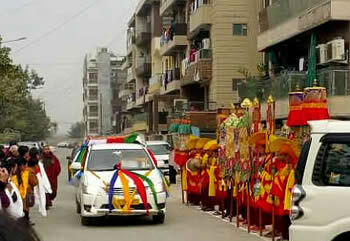 The Kudung of Kyabje Taklung Tsetrul Rinpoche arrived at the Mindrolling temple in New Delhi. Minling Sangyum Kushok, Mindrolling Jetsün Khandro Rinpoche, monks and nuns of Mindrolling and Samten Tse gathered in New Delhi to offer prayers at the Kudung. The entire sangha worked together to prepare the temple and make vast offerings and prayers. Ven. Gyalsay Rinpoche, Dakpo Rinpoche, Ven. Tulku Dakpa Rinpoche, Minling Dorje Lopön Jurchodla, all senior managers and administrators of Mindrolling led the prayer ceremonies. Hundreds of people gathered to receive the blessings of the Kudung of Kyabje Rinpoche. Early morning on the 16th January 2016, the Kudung was taken to Simla to the main monastery of Kyabje Taklung Tsetrul Rinpoche. The Kudung will remain there for the coming year.